Technical products require superior functionality and aesthetics in order to be successful in the marketplace. Rösler shot blasting systems offer you nearly unlimited options from deflashing, descaling, sanding and rust removal to roughening, matting, smoothing, edge rounding and shot peening. There are few technical applications for metal surfaces that can offer the variety of uses that shot blasting technology can offer. Finishing of mineral components such as concrete and sandstone, glass, textiles, wood and plastics is all possible with Rösler machines. The RBD is exceptionally suited for high volume continuous processing. The continuous belt blasting machine is available both with turbine and compressed air technology. Rösler overhead rail shot blasting units are recommended for the treatment of sensitive parts which cannot be tumbled in bulk loads, and for particularly complex, heavy, or large parts. Besides the monorail system there are also batch and continuous system other options. A complete blasting and painting line consisting of individually adapted conveyor systems, a pre-heater, shotblasting machine, paint booth, and a post treatment dryer. Conveyor systems can be chosen according to individual requirements, together with roller conveyors, traveling grates, and cross transfer lines, etc. A gas-fired pre-heater unit allows the treatment of wet or even ice-covered material from outside storage. The paint layer produced in the paint booth will be dried in line by the post dryer unit, allowing the handling of the components immediately upon exit for further treatment steps. To reduce energy costs, the final drying process uses waste heat energy from the pre-heater. 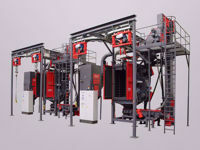 This type of system is characterised by its multiple applications. Components with different sizes, shapes and geometries, as well as delicate components, can be processed easily. Overhead rail shot blasting units are recommended for the treatment of sensitive parts which cannot be tumbled in bulk loads, and for particularly complex, heavy, or large parts. The parts are mounted on a hook and transported into the blasting chamber. The simultaneous rotating and oscillating movement of the hook ensures that the blasting media, accelerated by the multiple turbines, reaches every component, providing the best possible uniform blasting result. Rösler Overhead Rail units are very versatile units, and their compact design requires minimum floor space. These machines are excellent for all-round, complete and continuous blasting treatment of flat as well as voluminous and very complex components. With 4 or 8 high power Hurricane turbines, mounted around the housing (both vertically and horizontally inclined), it is also possible to treat very complex components, which have "pockets" or difficult to reach areas. A highly wear-resistant wire mesh belt, with tension adjustment, provides the part transport. The special belt guiding enables the lower turbines to blast only through one belt position, which means that any masking is kept to a minimum.